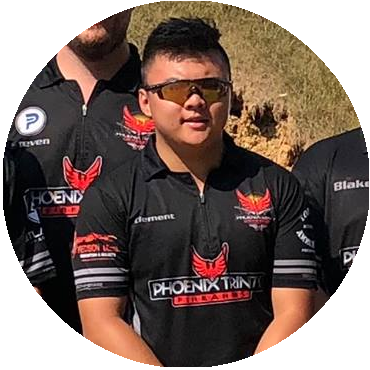 Clement has been a member of Phoenix Trinity for 3 years, which is the same amount of time he’s been shooting professionally, and has competed in about 50 matches. He shoots in several divisions, including Pcc b class, Open a, and Limited b. Clement enjoys shooting 3 gun. Clement’s sage advice to new shooters? “Don’t shoot your foot.” His favorite gun setup is his Mr. HO open gun. In his free time, Clement enjoys hanging out with friends.